There might have been a bit of confusion when trying to understand my precious article Intuition & Ego. In that posting, I didn’t clearly define the terms that I used and used a number of different words in order to try to explain the same (or similar) thing. Hopefully, the information below will help clarify what I’d intended to say. Being (i.e. be+-ing, by synecdoche), is an English word used for conceptualizing subjective and objective aspects of reality, including those fundamental to the self —related to and somewhat interchangeable with terms like “existence” and “living“. In its objective usage —as in “a being,” or “[a] human being” —it refers to a discrete life form that has properties of mind (sentience), which are deemed to constitute a more complex state than simple organisms (i.e. that have only “life functions“). In abstract usage, “the being” or “one’s being” is the mind’s concept of the self as a whole entity —including both mind and body —wherein the being is in the mind, and the “body” is all sensory aspects within the being. Heidegger coined the Germanic term “dasein” for this property of being in his influential work Sein und Zeit (“this entity which each of us is himself…we shall denote by the term “dasein.””), in which he argued that being or “dasein” links one’s sense of one’s body to one’s perception of world. Heidegger, amongst others, referred to an innate language as the foundation of being, which gives signal to (and from, cf. cognition) all aspects of being. With my current understanding, I would word this differently. Something like: Your Being encompasses all that you are including your mind, body and everything else that makes up who and what You are. Your Being is the root of who you are. Your Being is the ‘I’ in I am. In the context in which I’ll write, Your Being is a unique living entity that has a whole bunch of tools at its disposal in which to enhance the experience of life. Senses are the physiological capacities within organisms that provide inputs for perception. A sense in biology and psychology, is a physiological method of perception. In common usage, a sense may also mean an understanding or awareness of something in particular. Perception (from the Latin perceptio, percipio) is the process of attaining awareness or understanding of the environment by organizing and interpreting sensory information. All perception involves signals in the nervous system, which in turn result from physical stimulation of the sense organs. For example, vision involves light striking the retinas of the eyes, smell is mediated by odor molecules and hearing involves pressure waves. Perception is not the passive receipt of these signals, but can be shaped by learning, memory and expectation. Perception involves these “top-down” effects as well as the “bottom-up” process of processing sensory input. Perception depends on complex functions of the nervous system, but subjectively seems mostly effortless because this processing happens outside conscious awareness. This definition is mostly in line with my understanding. The part that I somewhat disagree with is the part “All perception involves signals in the nervous system, which in turn result from physical stimulation of the sense organs.”. If the definition of nervous system was Your Being and they dropped the part about “… which in turn result from physical stimulation of the sense organs” I might feel better about what’s been collectively written. I might write the definition like; Perception is the process of understanding or becoming aware of sensory information. Perception is a conscious activity, yet sensory stimulation quite often happens outside of conscious awareness. Let’s now bring these three together. Your Being perceives by sensing. That came together pretty easy! In a way, it seems so simple. This, to me, is the input side of life. Because during the process of life we interact with our environment, there is a similar path for the output side of life. Creativity refers to the phenomenon whereby a person creates something new (a product, a solution, a work of art, a novel, a joke, etc.) that has some kind of value. What counts as “new” may be in reference to the individual creator, or to the society or domain within which the novelty occurs. What counts as “valuable” is similarly defined in a variety of ways. If you look at this common definition while keeping the idea of senses in mind, you’ll get the feeling that the type of things that they list as being ‘created’ are things that are clearly discoverable by the standard five senses. To get a better feel for how I’m using it, we want to go a little deeper. It is generally thought that “creativity” in Western culture was originally seen as a matter of divine inspiration. An epiphany (from the ancient Greek ἐπιφάνεια, epiphaneia, “manifestation, striking appearance”) is the sudden realization or comprehension of the (larger) essence or meaning of something. The term is used in either a philosophical or literal sense to signify that the claimant has “found the last piece of the puzzle and now sees the whole picture,” or has new information or experience, often insignificant by itself, that illuminates a deeper or numinous foundational frame of reference. What we see here is that when someone has an epiphany, they have a sudden realization or comprehension of something. Simply put, how I would interpret this is that Your Being suddenly becames conscious of something (new). The knowledge or understanding that already existed now becomes something you can consciously act upon. And if you’re taking notes, this is similar to what we saw in the previous posting regarding intuition! When we go to put these ideas together, I generally refer to creativity as the process by which Your Being transfers knowledge or understanding (which is generally thought of as an epiphany or intuitive understanding) where you actively express that new understanding in some form. Typically, someone may verbalize the experience to someone, it may be written down or acted out or felt. In general, it is the act where Your Being communicates in a way that is detected consciously and acted upon. The thing that unites these two different key characteristics that make up how you function is energy! I will leave the energy discussion for another day, but for Your Being to be able to either receive or transmit information, that information, however subtle it is, needs to flow to the tools that we have that can interpret it. The most interesting part is not the energy, but rather the energy flow. The energy flow is what we experience and call life! That is what needs to happen for us to either sense or create something. The stronger the energy flow, the larger the impression on Your Being. If the energy flow is subtle, than the more stimulating energy flows need to be calmed so that the tools that receive the subtle flows can actually sense or intuit it! I am so looking forward to expanding upon these ideas with more detailed postings. For now, I hope you have a better understanding with regards to the words I used in my previous posting (and some even earlier postings). I love exploring the intricate aspects of what it means to be human. Sure, we are made of flesh and bone, but there is so much more that really goes into defining how we experience life than the simple senses: taste, touch, smell, seeing and hearing! We are highly developed sensory Beings that can – not only sense what’s going on around us – but actually shape our own experience. It’s subtle, but observable – if you put the effort into watching, practicing and consciously participating in what you do and how the world responds to what you do. In order to really do this, one needs to understand what and who they are. Eckhart Tolle distills complex spiritual theory down into common truth. That common truth can forever change the way you perceive your world – if you understand what he’s saying. Fortunately for us, his words have been viewed by so many that it’s easy to find some of this key ideas on the web. For Tolle the ego is a sense of self derived from the content and activity of the mind. It is “a mental image of who you are, based on your personal and cultural conditioning.” He notes that virtually everyone hears a “voice” in their head all the time, the involuntary and often repetitive thought-processes of our minds. As we live “the voice comments, speculates, judges, compares, complains, likes, dislikes, and so on.” It may be reliving the past or rehearsing imagined future situations. A twisted interpretation might be, not only do I have the sense of touch, the sense of smell and the sense of sight, but I have the sense of self! That’s right, it’s another attribute of our being human! That voice in your head is no more evil than your sense of smell. It is … what it is. That sense of smell can sense small amounts of vapors or various substances but there are a sequence of events that occur based upon that stimuli. To start with, if you’ve never smelt a rotting animal, the experience upon detecting this smell is immediately emotional. The smell is repulsive. Instinctively, you would step away from the smell. Meanwhile, as soon as the smell is detected, the voice in your head might say “Oh my God! What a foul smell. What could that be? It’s disgusting…” Then, through a little bit of investigation you discover the source of the foul smell. At that point, an association is made between the smell and the source of the smell. Depending on the level education (ability to label things), you may be able to describe the experience well. If you don’t have any idea what it is, all you can go on is the emotional experience. The key thing to notice in this discovery process is that when you sense something it is your Being that experiences what the senses provide. The voice in your head is a side show that may or may not fully understand what is being sensed. To me, this is a very strong statement that you might not want to simply breeze by. Your Being receives what you sense. The voice in your head does not! Your Being acts upon the stimuli in a pure unhindered way. The voice in your head responds to what your Being experiences in order to enhance it. The voice in your head adds an intellectual understanding to the raw experience. That voice in your head, because it is language based, can also be thought of as a translator. It is used to ‘label experiences’ in ways that can be shared with others. Note that the voice in your head didn’t cause the experience, it just translates (or maybe narrates) the experience. The experience still happens to the Being. Thinking back to the smell example above, how is it that the Being (you) first react to the smell? Does your body process the smell, associate it with rotting flesh and the voice in your head yells danger – danger? No. You immediately feel repulsed by the smell. You have an emotional reaction. If the smell had been that of a ripe cantaloupe, the emotional response would most likely be attractive. The smell would make you feel good. Upon investigating the smell, you may discover something wonderful to eat. But in every case, the response is emotional. Emotions aren’t something you can touch, smell or see, but there are none-the-less sensed! You might say that we have the sense of emotion! Ha! We’ve found another human sense! When dealing with emotions, we generally feel either attracted or repealed (to some degree). It’s only when the translator gets involved that we start thinking about it as love or hate, or happiness or sadness, etc.. Keeping the translator aside, the sense of emotion is normally strong or weak rather than good or bad. Physically speaking, emotions take the form of energy (light or electrical pulse) more-so then just about anything. When you deal with the five primary senses, a scientist would say that the vapor triggers the receptors in your nose to send a signal (via your nervous system) to your brain where it is processed. If you where to ask me, I’d say that the vapor triggers a receptor that sparks the flow of emotion which is understandable by your Being (consciousness). This brings us around to how your Being communicates. If you ‘listen to the voice in your head’ – how do you hear it? You’re ears translate sound waves into electrical impulses (energy, light) that enters your nervous system that get processed by your Being. It would seem that the voice in your head would do the same thing if it wanted to be heard (sorry about talking about it as if it had a ‘mind’ of its own). In other words, the evidence suggests that your Being doesn’t hear sound, it senses energy. The voice in your head is simply energy shaped by your Being. Converting physical sensations into energy is the technique by which the Being realizes its experience in the world. The Being doesn’t use organs like eyes and ears, but rather has eyes and ears and crude ways to sense specific types of energy. The reverse process: Creation (part of communication). If you turn this process around, it would make sense that the Being also uses energy to communicate. If you want to convey something that you ‘know’ to someone else, it generally has to be translated by physical senses (created) so that it can be shared. This would involve describing a smell or texture in a way that someone else can relate. If they don’t have an understanding of the words (or the other means of expression) they will not understand what you’re trying to communicate. Yet, when you look at how the senses are designed, there are unique paths for input and output. For instance, even though we hear with our ears (which are considered sensory organs) we speak to generate sound. The sound that we generate is a direct reflection of our Being. There is nothing stopping you from saying whatever it is that you want to say. The only time your sound is censored is when your Being consults the translator (voice in your head) to make sure that what will be said is exactly what you intend to say. There is also movement and expression. Your body will naturally reflect your current emotional state. It is pretty easy to physically see the difference between someone that is happy and someone that is sad. These are universal traits that form a layer of communication – weather you are aware if it or not. When it comes to communication, the energy flows from your Being and gets translated as that energy makes it into physical form. If the energy can make it through unedited, it’s a pure reflection or manifestation of your Being. Singing, dancing, making something (creating) and intuition are quite often considered uninterrupted. Intuition is the ability to acquire knowledge without inference or the use of reason. Considering this, along with my interpretation above, when you intuit something you experience pure understanding from your Being without having to translate it through the ego. That understanding comes from pure energy. As that energy leaves the spirit (Being) it enters the body and gets processed by the appropriate ‘tool’. If it comes through as logical energy, it might feed the ‘translator’ in such a way that the energy is intellectualized so that it can be recorded or spoken. That energy may also come through as a feeling, which, rather than being intellectualized, it is expressed through the body. In any case, it is energy that you share with yourself. It is a very subtle energy that many people overlook, or undervalue, yet it is there always available for the observant. Meditation, as it turns out, is a conscious practice where major energy components of the body (and mind) are energetically reduced in order to allow essence of your Being shine through. As you reduce the energy flows to places like your ego, the synchronicity of the underlying subtle energies (like emotions) become more predominant. When the energy flows slow, the affect is like removing all the big waves from a pond. After doing so, any small wave can be observed and explored. It is in these states that the Being can sense subtle energies that don’t normally come through the standard sensory paths (eyes, ears, etc.). It is in this calm that things like intuition can be felt. Or, more importantly, the emotional energy that surrounds you. Or even, it is in this calm that you can sense the energy of others! Yes, that is correct. The energy that you give out influences your environment. Likewise, the energy that others give out also influence the environment and you can pick this up just like you sense your own energy! The problem most people experience is that they can’t tell the difference between weather it’s their emotion or if it’s someone else’s emotion. This is where intuition and ego (the translator) get involved. If you are in harmony with yourself, you should intuitively know if the emotion is yours or not. If there is too much noise preventing the intuitive understanding from coming through, consult the translator. The ego is a good consultant that should be able to help you identify the source of the emotional energy. A couple key things that the ego and intuition show us is that at our core, the I am inside each one of us receives and emits energy as it’s form of perception and creation. We sense energy. We have physical tools that help us sense energy. We are not simply hands and feet (flesh and bone) but the core spirit uses energy as its key interface into our physical world. So, even though you may not make a sound, you can still be heard. Sending an emotion is much stronger than sending a thought. Calming yourself helps you feel other energies. Wow. I loved writing this. I hope you can feel the energy too! The thing that I love about this recipe is that you don’t have to go out and buy expensive tahini! Most every zucchini hummus recipe that I’ve seen requires just a few tablespoons, but the jar from which you get the couple tablespoons costs more than 10 bucks. Cost is a major deterrent when most everything else is on hand and ready to go. 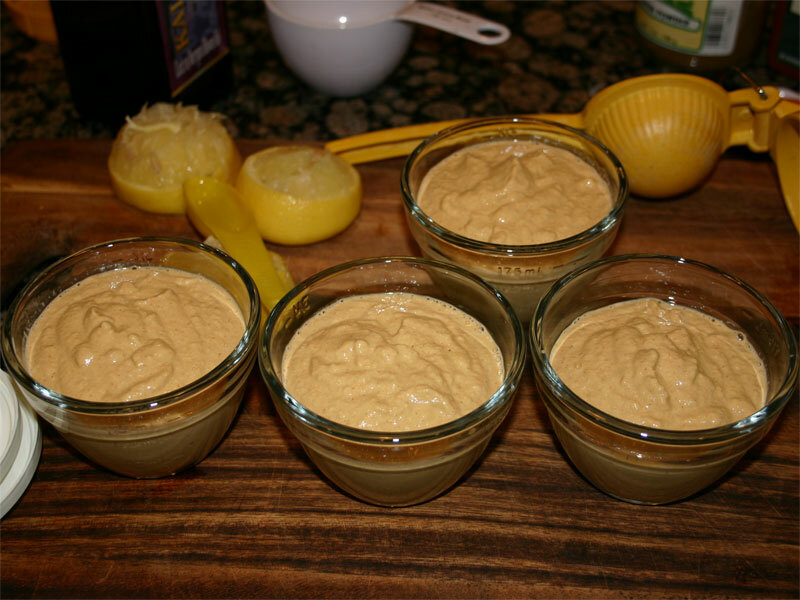 This hummus is full flavored and creamy. The lemon shines through and, if you add a pinch (literally just a pinch) of cayenne pepper, the heat will carry the smoky paprika so as to make this one something that you can really eat a lot of. It’s also not stiff like what you’d find using garbanzo beans and, if you don’t get carried away with the liquid, it will not be runny. 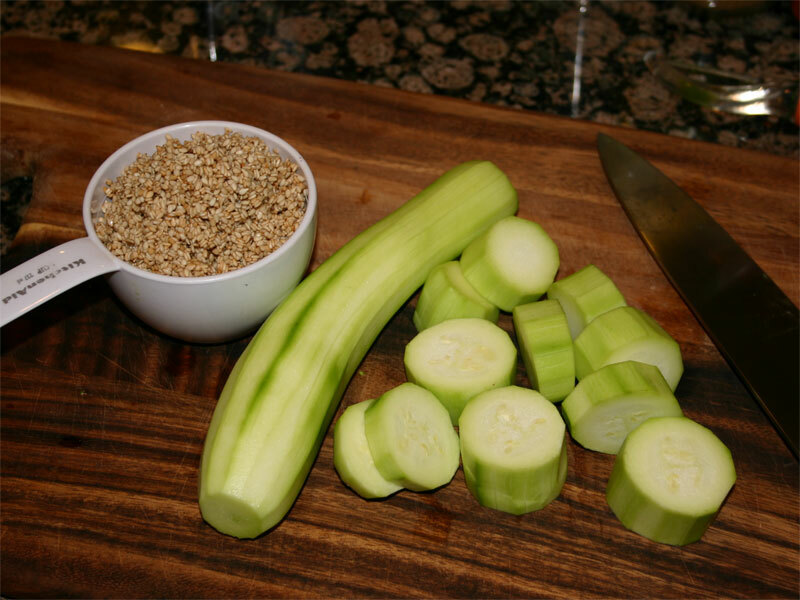 There is a delicate balance that must be observed – that can be corrected with more sesame seeds! You want the end product to be able to stand up slightly. You’ll want to start the day before by soaking the sesame seeds for about 8 hours, draining and letting the germination process happen. They should be ready at about 24 hours. (In other words, soak overnight, drain (and rinse) and then let them grow all day so that it can be prepared later in the evening). Peel and slice the zucchini and chop the garlic. It’s just faster in the blender when the zucchini has been chopped smaller. Now, in your high powered blender, add at least a cup sprouted sesame seeds, chopped garlic, the oil and the lemon juice and blend. You might have to work this in a bit in order to get all the seeds broken down. The mixture should be like peanut butter after a few seconds. Next, add the zucchini. You’ll probably need to plunger it in. After blending for a little while, add the seasonings: Salt, cumin, paprika and maybe a little cayenne pepper for heat (go really light on the heat for there is nothing to temper it here). If it’s a little runny, add more sesame seeds. Then, continue blending until smooth. There you have it. 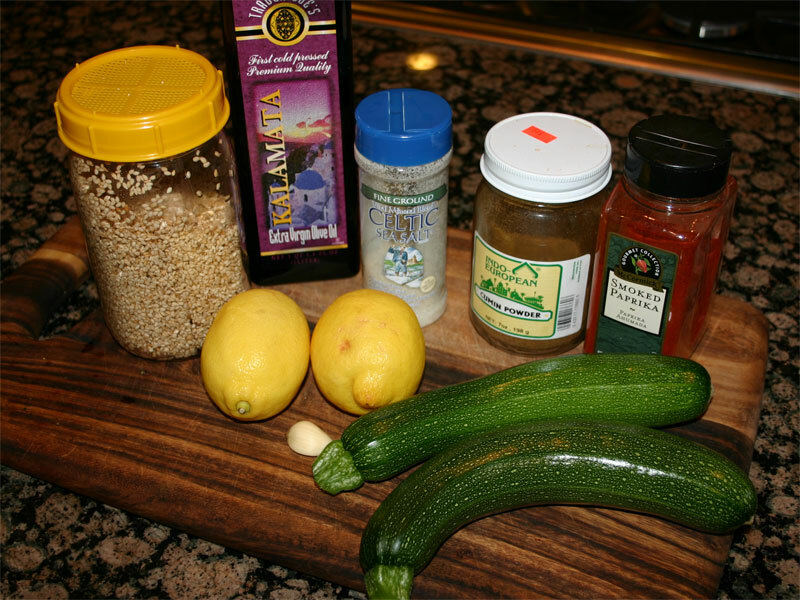 The best zucchini recipe on the web! And, before you go thinking that I’ve created this from scratch, I’ve got to give credit to Carmella (of The Sunny Raw Kitchen). She posted the root version of this on the web back in 2007. The only real change that I made was to sprout the sesame seeds first. 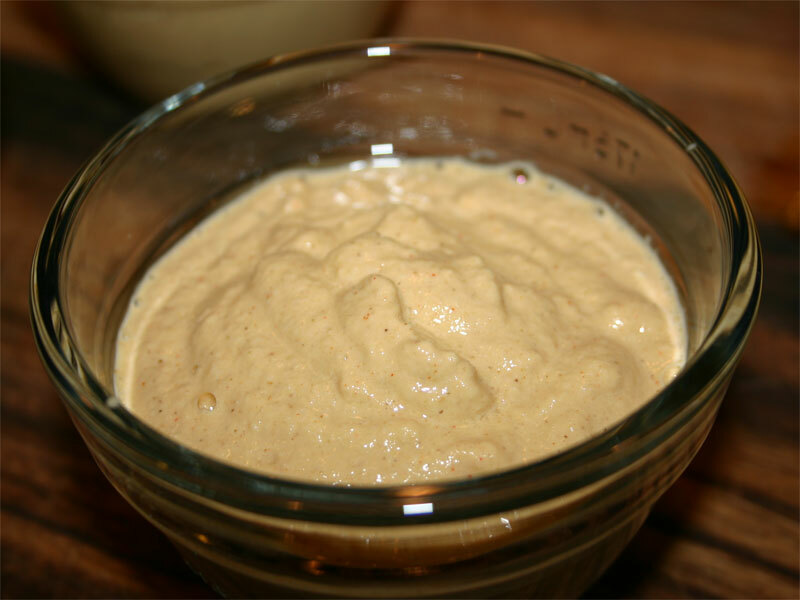 This recipe makes about four cups hummus. I’d say that ¾ cup is a serving.